...but not the only post, in all likelihood, to express our displeasure to them. The Weather Channel has released this winter's names for winter storms, thanks to students at Bozeman High School in Bozeman, MT. The students are from a Latin class and were given the assignment to come up with a list of names. And to prove it isn't just about meteorology anymore when it comes to weather, I present this quote. "The naming program last year was a huge success, with well over a billion impressions on Twitter and regular use by numerous schools, agencies and media outlets," said Bryan Norcross, senior hurricane specialist at The Weather Channel and compiler of the list. "It's simply easier to communicate about a complex storm if it has a name, which our naming program last year demonstrated. And good communications benefits everyone." Media (er, hype) is trying to win the battle to name every. single. thing. Certainly helped that TWC'ers were out in force hashtagging every winter storm with a name, with only a couple of those names actually trending nationally over the course of the winter. 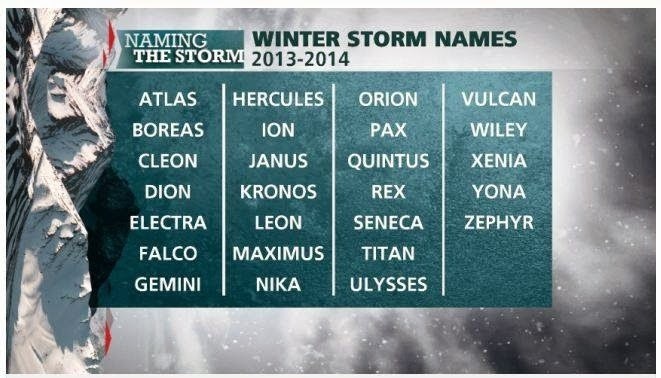 We, like last winter, will not acknowledge the use of the names in any winter storm. We continue to believe that naming winter storms is entirely too subjective and the impacts from storms vary too widely across the country to justify such a use -- given a storm in the Pacific Northwest will have different impacts than a storm in Buffalo. Until a concrete, known, objective set of data is made known nationally and produced by a government agency or a collaborative of scientists who are naming storms because of objective criteria and not because of some in-house formula that nobody will know about, we will continue to avoid referring to winter storms by name at this site.